What I love: I love Avocados and I eat a lot of them and use them in a lot of dishes. I usually use a pairing knife and a spoon to open them but it's never easy. 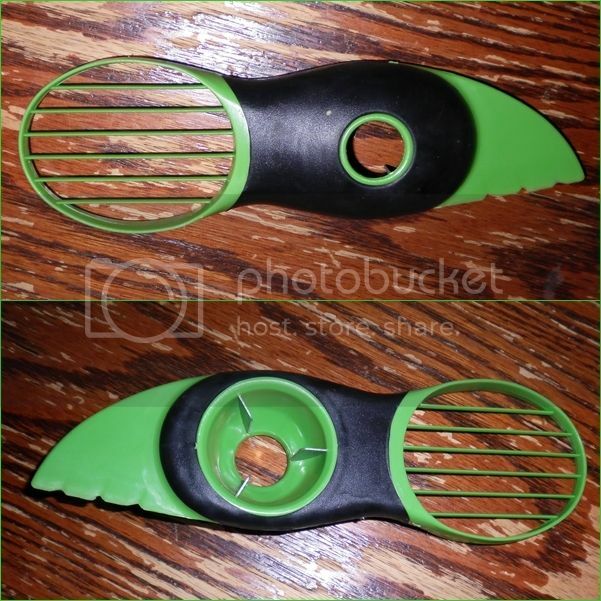 The Avocado Slicer 3 in 1 by Fit Kitchen is my new favorite kitchen tool. It's made of plastic except for the 3 points used to remove the avocado pit but it feels pretty durable so far. To use it is so easy. First you use the blade to slide the avocado in half. Then you separate the halves exposing the pit. If the pit doesn't fall out easily you just use slight pressure to let the teeth grasp it and twist using the pit remover. Then last you use the oval slicer by pushing down on the avocado and sliding, giving you quick and easy avocado slices. The great thing is you can throw it right into the dishwasher when you are done. I love how quick and easy it is to use!